The Milanese fashion giant has teamed up with Japanese Manga artist Hirohiko Araki to create a window installation inspired by the label’s Resort 2013 collection. 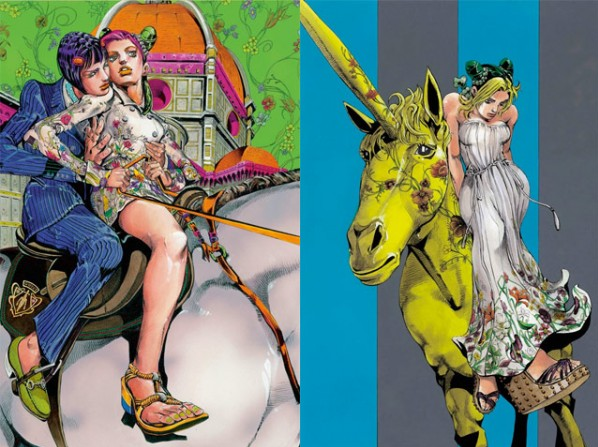 Entitled “Jolyne, Fly High with Gucci,” Araki's Manga tells the adventure of Jolyne Cujoh, a student who inherits a keepsake from her mother’s Gucci collection. Propelled by the mystery behind her vintage treasure, Cujoh embarks on a journey that “transcends time.” The images echo the color palette and aesthetic of Frida Giannini's Resort collection and the label’s iconic flora print.